An undisputed underground Thrash legend. Buena Park, California's HIRAX was created in 1984 by vocalist Katon W. DePena, bassist Gary Monardo, guitarist Bob Savage and drummer Brian Keith from the defunct L.A. KAOS and KGB. The obligatory first demo was a much sought after item on the tape trading scene. Co-produced by the band and Y&T guitarist Joey Alves, the tape contained four tracks of Power Metal muscle and HIRAX made further inroads with a track on the compilation album 'Metal Massacre VI'. 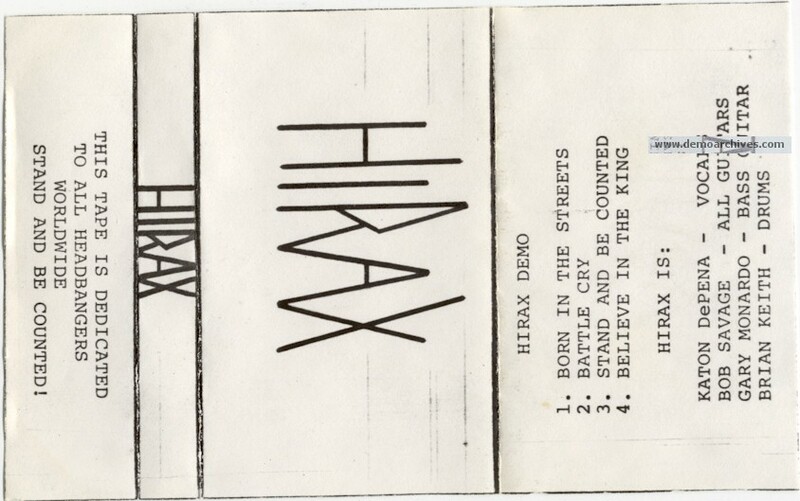 The debut HIRAX album, October 1985's 'Raging Violence', with drummer John Tabares, was a solid display of intense metal marred by a weak production. An attempt to revive the name with De Pena and Tabare was attempted in late 1987 and resulted in the original line-up of the band reforming and recording a three track demo in 1988. Tracks from this tape emerged on the 'Blasted In Bankok' single. Xeroxed covers. Recorded onto studio tapes with a nice sticker on the shell.